These 10 men comprise the U.S. 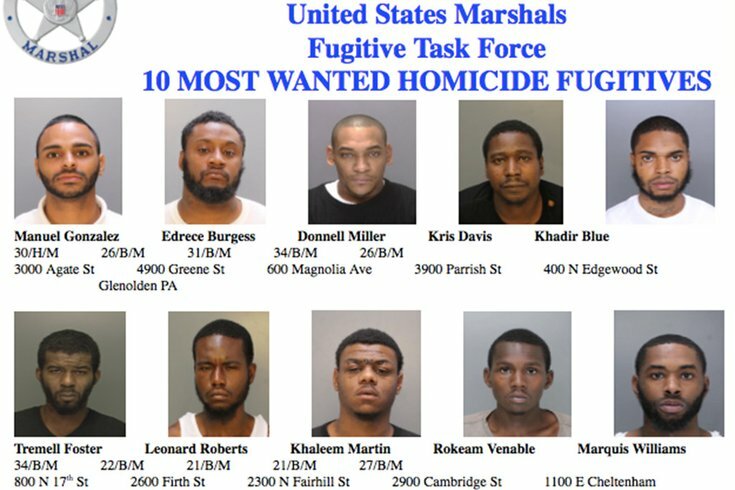 Marshals' "10 Most Wanted Murder Fugitives in Philadelphia." The U.S. Marshals Service is seeking the public's help in locating its "10 Most Wanted" murder fugitives in the Philadelphia area. The agency's Eastern Pennsylvania Violent Crime Fugitive Task Force said cash rewards available for anyone with information that leads directly to the arrest of these 10 fugitives, all of whom have active felony warrants for murder. These suspects have lengthy criminal histories and should be considered armed and dangerous, the agency warned. Tips can be called into the U.S. Marshals Tipline in Philadelphia at 1-866-865-TIPS(8477).